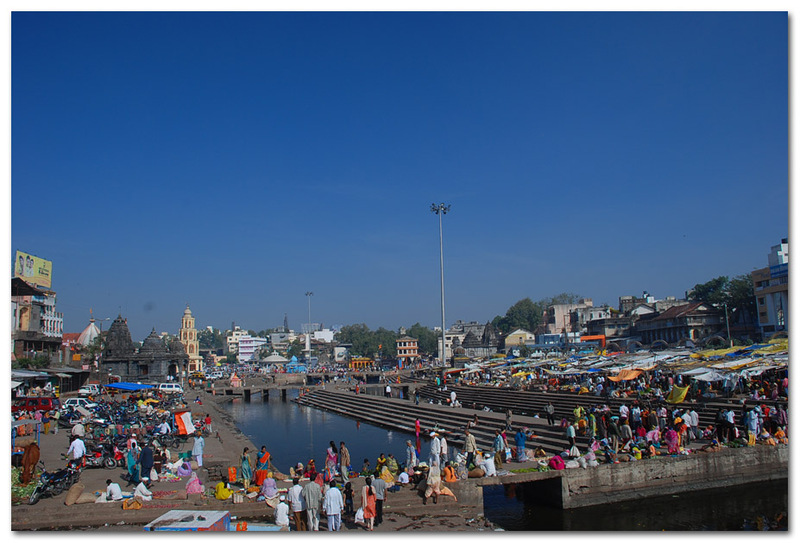 "Welcome to City of Pilgrimage" is with what Nasik(or Nashik) welcomes you when you reach their by road. 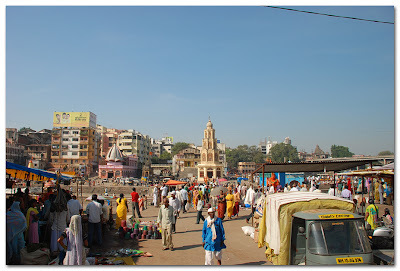 It was my third day of Shirdi/Nasik trip (See blog for Shirdi & Trimbakeshwar covered in first two days). 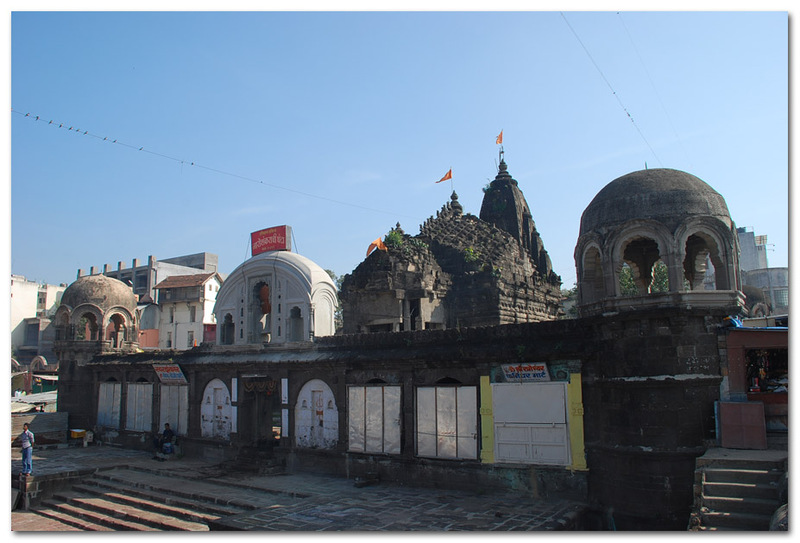 Nasik is one of the most holiest places in India and is sacred as it is in this place Lord Rama along with Devi Sita and brother Laxman spent their part of the exile period and has witnessed several mythological events. 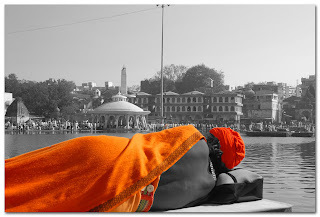 Its is one of the four cities which hosts Kumbha Mela which occurs every after 12 years (next is on 2015). Legend has that during Sagar Manthan the Demigods while they tried to hide the Nector of Immortality from the demons, four drops fell onto the four location on the earth (other location are Prayag,Haridwar and Ujjain). 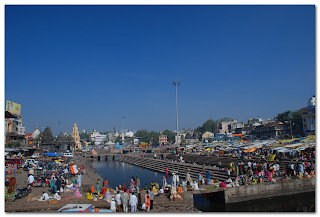 Thus these four places are believed to have acquired mystic power and hosts the Meha Kumbha Mela every after 12 years ("Kumbha" means "Pot of Nector" and "Mela" means festival) where dates are calculated depending upon the certain planetary positions. 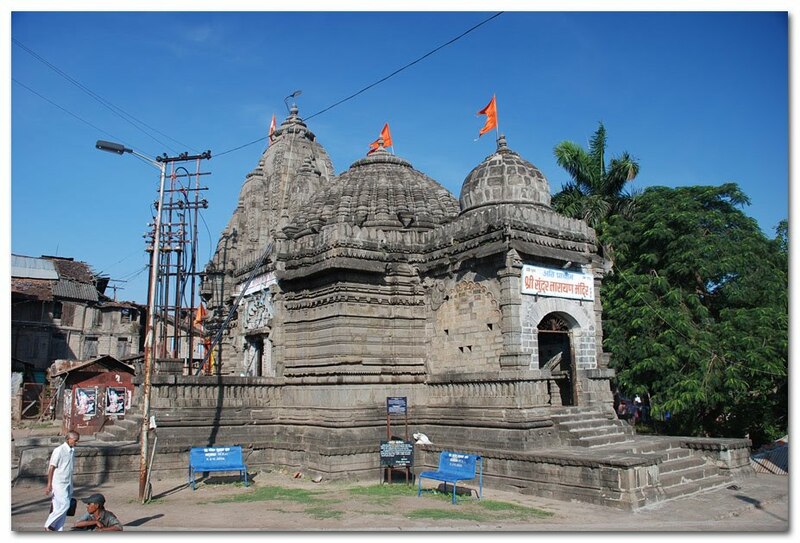 In the medieval era several temples where built by devotees along the bank of river Godavari. The name Panchavati it got is from the five banyan tree present in the vicinity where Lord Ram and Sita spent their exile period. 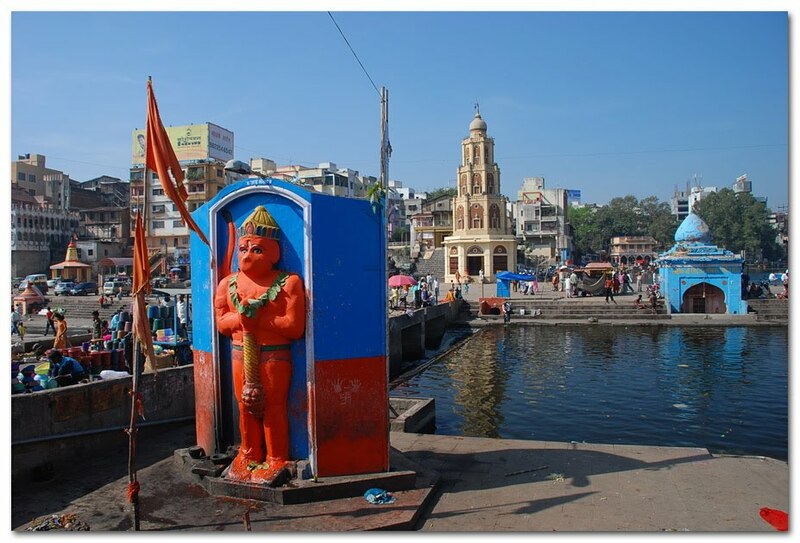 The name Nasik also has a legend, during exile period Laxman (brother of Shri Ram) cut off Shupernakha's Nose (In Sanskrit Nose means "Nasik") and throws it on other side of the river Godavari (Ganga) which then christened as "Nasik" or "Nashik". 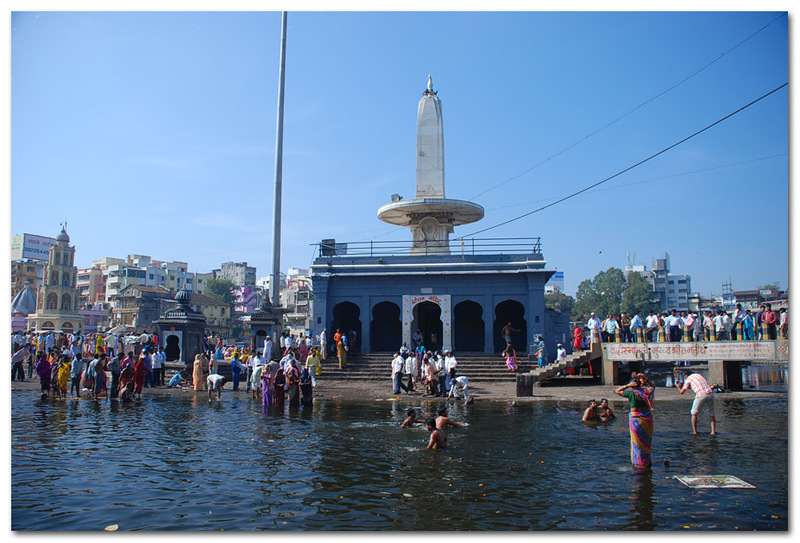 Thus on one side of the sacred river is known as Nasik while other side where five banyan tree is known as Panchavati. Various legends are associated with each of the places here and its to be noted that Lord Rama hasn't consecrated any of the Idols during his exile period here though some of the priests here falsely claims that some Shivlingams are consecrated by Lord Rama himself. Most of the temples falls in Panchavati province where only one or two resides other side of the river Godavari i.e. in Nasik. Just in front of Ram Kund is the Shiva Temple called "Kapaleshwar", Its around 250 years old and probably the only temple in the world where Nandi Idol is not placed in front of the Shivlingam. The very reason is it is at this place where Lord Shiva considered Nandi as his master. Legend behind this is, Lord Shiva incurred a sin (Brahma Hatya) by cutting off one of the Lord Brahma's head (fifth head). Shiva wandered the whole universe and tried every possible penance to get rid of this sin but all went into vain. Then Nandi advised him to take holy bath in Godavari which he followed and was purified (this is what told by my guide). Other sources relates this sin incurred by killing a cow by mistake. Whatever be the story, the bottom line is that Lord Shiva accepted Nandi as his master due to his advice, which is why we don't see Nandi Idol at its position (i.e. infront of Shivlingam). 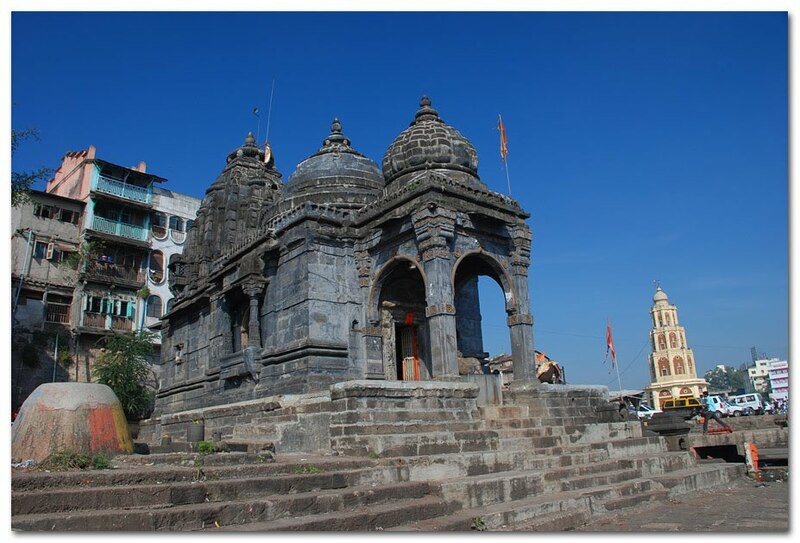 This is Shiva temple built by Naroshankar Rajabahadur 1747 along side of Godavari. It is fortified by 11 feet tall stone wall on each corner of the wall is a dome like structure built, where one of them is said to be washed out by flood in Godavari river. The most noticeable thing about this temple is the 6 feet wide Bell which is fixed on top of the entrance gate of this temple. The Maratha Ruler Bajirao Peshwa’s younger brother Chimaji Appa won the fort of Vasai against Portuguese.After winning the fort, Vasai Portuguese Church bell was removed, marched on elephant till Nashik with great celebration and offered to Naroshankar as a medal - an award for his bravery. It is made of bronze, with six feet diameter. The year engraved on it is 1921. The temple is beautifully sculpted from outside and is raised on a 2 feet platform. The architect is more similar to Tirmbakeshwar temple (only the roof of sanctum sanctorum) . Photography was allowed so was able to click some. No entrance fees for any of the temple in Panchavati. The style of this architecture is called "Maya". Now the interesting part, as per the priest this temple is 10,000 year old and Shivalingam is placed by Shri Ram himself. As I said earlier you need to cross verify each legend you hear. There is no formal information inscribed anywhere in the temple which would verify the history. Whatever be the case all temples throughout Nasik seems to follow same style of architecture i.e. there are 3 domes out of which the one which houses the sanctum sanctorum is the tallest, the smallest is for the entrance and the middle is of the hall/space in front of sanctum sanctorum and is in circular dome shape from inside. Its a Shiva temple on the river side, didn't get much information about this temple. It has Idol on both side of the structure I didn't know that earlier and thus only showing the Idol of one side. On side of wall there is a painted water meter to measure the level of water during flood. It is believed that flood no matter at what level it never touches or raise upto or above the Idol head. (my guide didn't mention this :-( so again discrepancy in facts). 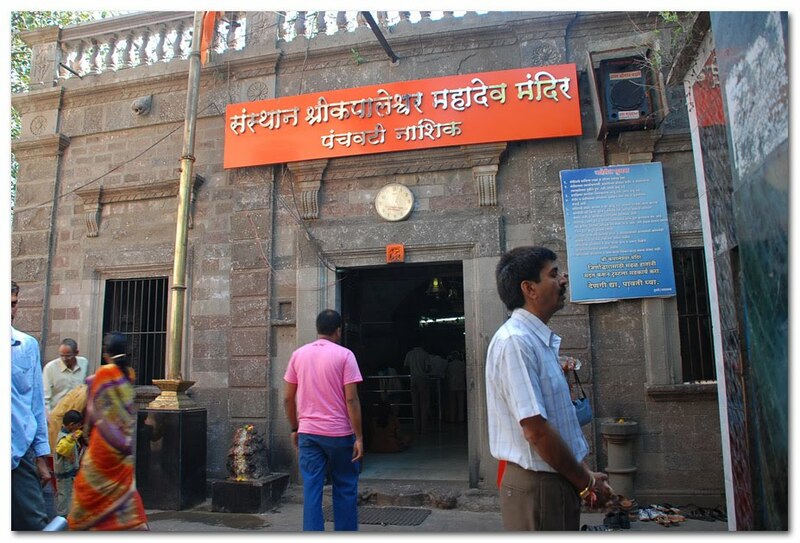 It is situated in one end of the Devi Ahilliyabai Holkar bridge (from where I shot the panoramic pic, first pic). Its a Lord Vishnu's temple and why its named as "Sunder" is because he was once become ugly by the curse given by Jalandar's (wicked Demon) wife Vrinda. Due to curse Lord Vishnu turned black and ugly. He then took bath in Godavari and thus was relieved from the curse and regained his beauty again. So many temples along the bank of Godavari so does the legends of it. The temple is built by Gangadhar Yashwant Chandrachud in 1756. One remarkable thing about this temple is that it is built at such an angle that on 21st March, rays of the rising Sun first fall exactly upon the idols. Some sources says the rays falls on the foot of deity. Its Ram temple and named KalaRam ("Kala" means Black). The temple is built in the remembrance of the exile period of Ram during which his complexion became dark (this is as per my guide). 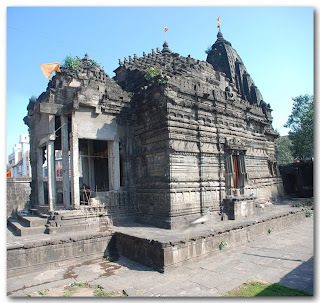 This is the only biggest temple of Lord Ram in Nasik and is built by Sardar Odhekar of Peshwas with black stones brought from Ramshej 200 years back. It took 23 lakhs and around 2000 workers to build this temple in 12 years. The Apex of the temple is made up of 32 tons of Gold which is said to be gifted by Devi Aahilliya. Its a massive temple from outside and fortified with 15-20 feet wall. For the construction no cement is being used there was only three ingredients (choona, malaai and gur) used to clay the stones together. Photography was strictly prohibited though you can carry camera and mobile inside the temple. Since the Lord Ram's Idol is black here so does of Shri Hanuman. After the entrance you will step into a long varanda (or pillared corridor) at the starting of which is Hanuman's black Idol facing exactly straight to the sanctum sanctorum. This pillared structure is separate then the main temple and is constructed just in-front of it. There are total 40 pillars which are said to set because there are 40 shloka's of Shri Hanuman (i.e. Hanuman Chalisa). There is nothing else inside this structure except the Hanuman'd Idol positioned in start and the pillars which total counts to 40. Its an open architecture from the sides i.e. no closed walls. You pass through this and then will take steps to the main deity temple which is on the raised platform. There are total 14 steps to reach the temple door, 14 because Shri Ram spent 14 years in exile. All three gates of this temple has exactly 14 steps. 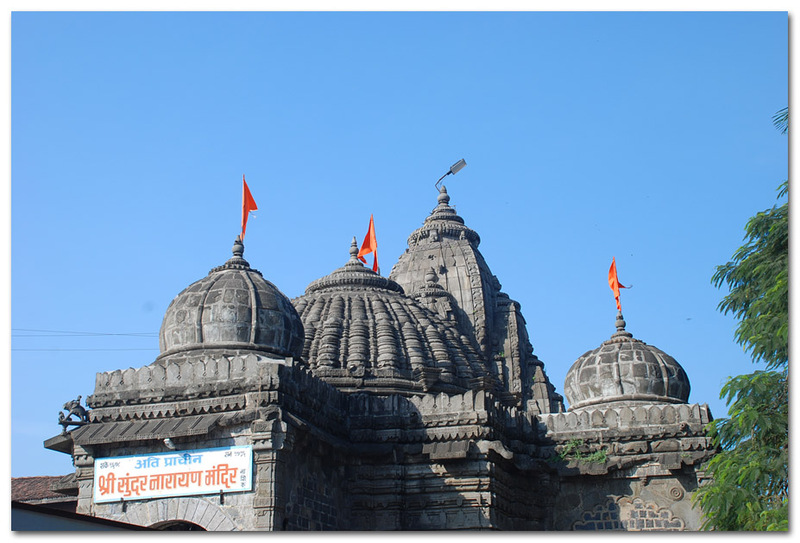 The architecture is very much similar to of Trimbakeshwar. As I mentioned earlier most of them are following same pattern, i.e. 3 dome structure one being the tallest which houses the main deity and one medium size which is the front portion/space of the sanctum sanctorum and the smallest in the front i.e. of the entrance door. The fortified wall has pillars too which total counts to 90, it has some reason for 90 but unfortunately I forgot what was that. On the back side of this temple is a Lord Ganesh idol with a stone platform just enough to enclose this Idol. 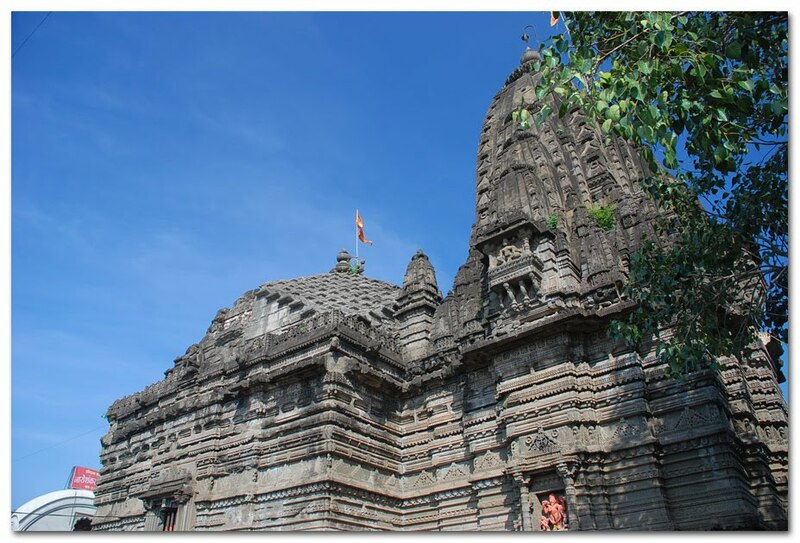 No separate guide or information brochure available, but it appearance is too aesthetic similar to Trimbakeshwar. This temple is thronged during hindu festivals like Ram Navami etc and probably the only temple (there is one more) where Lord Ram is enshrined in black stone. As per my guide the Idols are self emerged from the Godavari and since it was black in color so the temple was named as KalaRam. As the name says "Gore" (fair) the Idol inside is of Lord Rama fair in color. This temple is not a conventional one but resides inside a apartment like structure. The peculiarity of this temple is that it is made up of complete wood i.e. only the portion which shrines Lord Ram along with Laxman and Devi Sita. This is around 300 years old and the wood is still intact and has retained its strength. This was built to commemorate Lord's return from exile after killing the daemon Ravana and rescuing Devi Sita. Lord was resurrected as King and Rajya Abhishek was carried out. The process has made his complexion fair from dark so the Idol was made white in color and thus named the temple as Gore Ram. Just adjacent to KalaRam Temple is the Sita Cave, the cave which is believed to be where Devi Sita was stayed to hide herself from Demons. It was very unclear that how much the original cave differs from the today's structure. One has to literally crawl to reach the bottom of the cave (its not big though) where the three Idols of Lord Ram, Laxman and Devi Sita is shrined(not possible for obese people). Cave (though very small, you enter from one side and get off the other). In the bottom which is enough for 6-8 peoples to stand is well illuminated by mini tube light. Passing this Idol while coming up from other side is Shivlingam. History say's that its the same lingam which Devi Sita used to worship. Also some web site mentions this place as the very point where Devi Sita was abducted by Demon Ravan (to me its contradicting facts, since the Laxman Rekha is quite far from this place). Above pic shows one of the five banyan tree (total five banyan tree is present adjacent to each other) from which the name "Panchavati" derived. Pic on the right side is said to be Laxman Rekha which is now overflowed by municipal water (see the 2 feet wide cemented path underneath the bridge). Well you can't verify this just believe it or not. The bridge is named "Laxman Bridge". Small area scattered over 2-3 kilometers is together called tapovan (park where Lord Ram along with Laxman meditated and performed penance). From Sita Gumpha several shared auto rickshaws are available who charges Rs 30 per head to take you around Tapovan and bring you back. usually done in 30 min (not much to see). I took the same and Laxman Rekha (now a under bridge water line) was the first he showed us. Passing this we reached "Katya Maruti Hanuman" temple. It houses a massive 11.5 feet of Hanuman Idol and said to be self emerged and was found on a plants full of thrones thus got its name "Katya" means "Throne" (well this is as per the priest). History/web says it is built in 1771, by Shri Raghunath Bhatt Karte. This is the only temple in the world devoted to Laxman (brother of Shri Ram). The tree which is been shown is where Laxman is said to have mediated. Beside this is the temple built by devotees there after. It is believed that this is the very place where Laxman has cut off the nose of Surphanaka. Adjacent to this temple is Shri Ram ParnKutir (Shri Ram's cottage) where Shri Ram is said to have performed penance for one year during his exile. This is few meters further from Shri Ram Parnkutir and Sages visit this temple during Kumbha Mela. We are done roaming this area in 40 min, after which we are back to Sita Gumpha from where we boarded auto rikshaw. There are plenty others to see eg Pandav Cave which resembles with Ajanta Caves, though short on time thus skipped this one. The cave is around 10 km away from panchavati and is accessible by direct public buses. I am back to hotel room, took rest and started for Shirdi. For this you need to go Mahamaarg bus stand (10 min drive from CBS bus stand), you will get plenty of buses as well as private Qualis riders. Same two hour journey and I am back to Shirdi from where I boarded Volvo to Hyderabad. 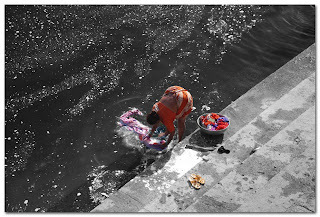 For her it doesn't matter if its Holy river or not, just wanted to finish her morning chores. In fact at every end of Holy rivers in Ghat (river bank), you will find people harnessing the facility to its fullest i.e. washing clothes and bathing etc. This is near bridge which I mentioned in Sunder Ram temple above. This is the opposite lane of Ram Kund and leads to temple KalaRam (at the end of this road, right side), GoreRam and Sita Gumpha (at the end of this road, left side). This is the very place where 35 people died and around 125 people were injured in stampede during Kumbh Mela 2003.
here you have mention sita cave . Here in nepal also there is sita cave in gorkha. Might be you are talking about sita cave in indai. Am i right ? 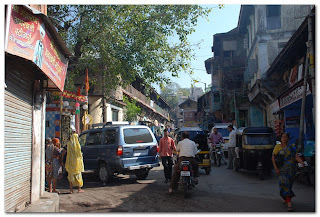 Yes Hira, this post is about Nasik (India) so all the references are for India only. Was it Brahma Hatya that led to the Kapaleshwar temple? Somewhere I read that it was Gowhatya! Anyway, nice blog and excellent photography. I am caught up with a wanderlust too but I guess I am too lazy to walk miles in the scorching sun.